Canals, historical architecture, quirky bars and an indoor clay court worthy of a tennis cup final. Welcome to Ghent in Belgium, the venue of choice for the 2015 Davis Cup final where Andy Murray hopes to lead Britain to victory! If you are heading to this beautiful Belgian city to witness history in the making, you might like to know a thing or two about the city in which you are staying, for the times that you won’t be watching Andy in action. Culture – Street art, and art in general is abundant in Ghent. There is an arts scene that permeates from the city centre to the harbour with arty shops and galleries in abundance. The music scene is also highly regarded out this way, with lots of clubs and bars to choose from playing an eclectic mix of sounds including jazz, funk, folk and electronica. 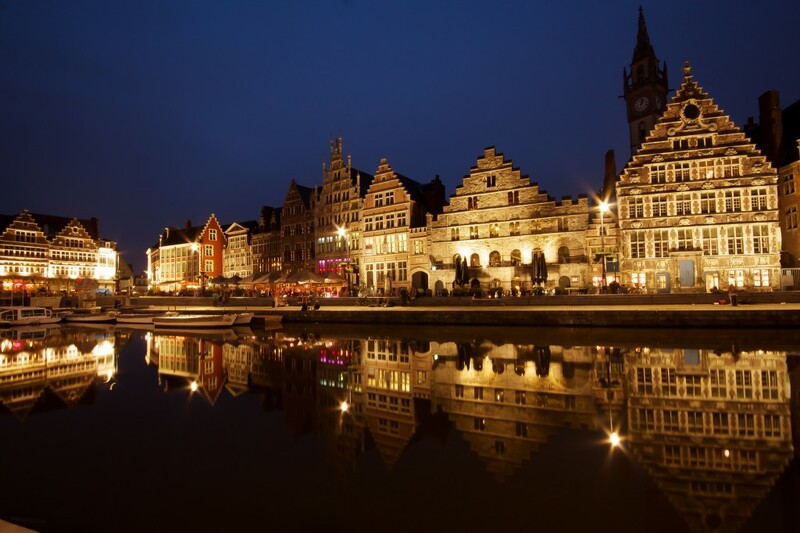 Ghent is also well known for its many museums, so there is always something to do even if the weather is wet. Quirky Bars – Believe it or not, Ghent is regarded as the vegetarian capital of Europe, so expect to find a diverse selection of veggie food options wherever you go. The selection of beverages on offer across the city is also diverse, and it has been said that if there is a drink you can’t find here, then it probably doesn’t exist! Amazing architecture – The canal-side buildings are truly amazing, with much of the city’s medieval architecture remaining in tact. The great news is that you can enjoy the views in total safety as the centre of Ghent is in fact the largest car-free zone in Belgium. Perfect if you fancy take a long exposure snap or two on your travels! Canals – One of the best ways to witness the amazing canal-side buildings is to take to the water. Canal cruises run several times and hour, and generally take around 40 minutes to an hour to complete an up-and-back route. The Flanders Expo in Ghent will stage the 2015 Davis Cup by BNP Paribas World Group Final from 27 to 29 November. The match will take place in Hall 1, one of eight multi-use indoor clay arenas, which has a capacity of 13,000. To find out more about tickets, times and anything to do with the tennis visit DavisCup.com. For information of the touristy variety turn your attention to the Ghent Tourist Website – a wealth of wonderful information! This entry was posted in Destination Guide on November 13, 2015 by worldwideinsure.